I miss those chubby cheeks, cute little toes, and the arms reaching out for you to be held. 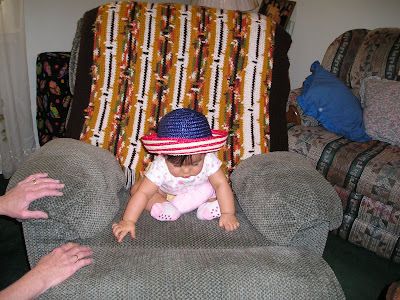 Our daughter Rylie when she was four months old. By the way, my mother and brother live in the Eastern Panhandle of West Virginia! love that hat! she sooo cute! thanks for stoppin by! Adorable child and great hat. Too cute. She is adorable:) Happy WW and thanks for stopping by. Aww, she's too cute! Happy WW. 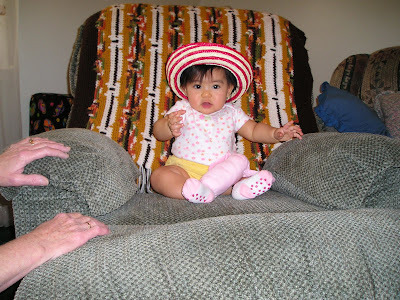 John have you consider to join her to a baby model pictorial when she was young? she's too cute she can be a babies dresses model for a store stock brochure..
nice hat. rylie is so cute. how are you john? woww.. she is so cute and beautiful. the hat fits really good on her..
She is a sweetie! Looks like sitting up is a great feat for her. I do like just a little splash if yellow. Your Babygirl is very pretty and cute! She's very cute in that hat! OMG! Rylie is very young here!